Crunching themes of versatile winter whites, my favourite wines and Saint Patrick’s Day lead me to one special winery for Wine of the Week #11. Rosehall Run Winery in Prince Edward County, is where Dan Sullivan, whose forbears came over from Ireland in the 1850s, keeps his gold in a bottle. The wine: JCR Chardonnay 2011 $29.95. It was made from grapes harvested from the oldest chardonnay vines on the estate, barrel fermented. and aged for 14 months in 30% new and 70% spent large French oak puncheons. The barrel fermentation allowed the lees (spent yeast) to coat the barrel softening the impact of the oak, giving a creamy taste to the wine. 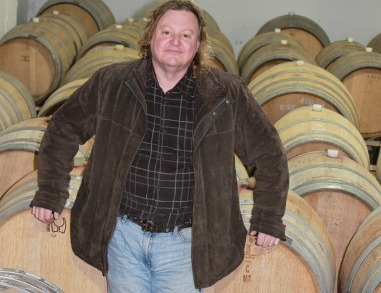 Sullivan began as an amateur learning from some of Niagara’s leading winemakers during his days of home winemaking when he bought and pressed Niagara grapes. These days, Dan is a director of the Ontario Wine Council and has been a certified Canadian Wine Judge. His wines, especially Chardonnay and Pinot Noirs have received international attention. The winery: Rosehall Run estate winery is owned in partnership by Dan and Lynn Sullivan with Lynn’s brother-in-law Cam (JCR) and sister Cindy Reston as silent partners. 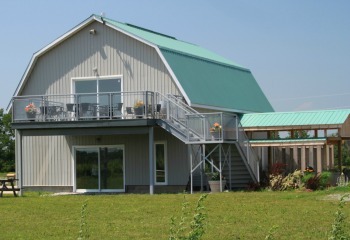 It is located between Hillier and Wellington on the Greer Road in Prince Edward County. Accolades: JCR Chardonnay 2011 was one of only two Canadian Chardonnays to medal in the International Chardonnay Masters in 2013 put on by The Drinks Business magazine of the UK. Also five leading Canadian wine writers have scored it between 88-91 and given it between 4 to 4.5 stars. I think I learned most of what I know about Ontario wines back in 2010 when I interviewed Dan Sullivan for Horn Trip Magazine. At the time, I told him I didn’t like oaked Chardonnay and then he poured me a tasting of his Cuvée County. It was a blend of oak and tank aged Chardonnay that was very easy on the palate and it changed my mind. Next I tried the fully oaked Chardonnay, it was rich with notes of white fruit, vanilla and creamed buckwheat honey. I didn’t buy it, I chose the more affordable and approachable Cuvée County but the memory of the taste haunted me for weeks afterwards. By the time I’d talked myself into buying a bottle, it was sold out. Like leprechaun’s gold, if you don’t hold fast when it’s in you hand, it’s gone. The JCR Chardonnay 2011 is the newest vintage of that fully oaked Chardonnay. The tasting notes say “enticing fruity aromas of golden delicious apple, and yellow pear with vanilla and toasty goodness undertone, on the palate layered with juicy citrus and tropical fruit, vanilla crème brûlée and subtle minerality with a lush, creamy lingering finish”. It’s the bottle of gold at the end of the rainbow for this spring’s St. Patrick’s Day. It will disappear fast. JCR Chardonnay is available at the winery and online.